Update 10/4: sorry for the delay. Here are your contestants. Voting will take place from today through 10/11 or whenever phpbb decides the 7th day is. Lots of really great entries. I encourage everyone to carefully look through all the galleries before making your selection. You can vote only once. 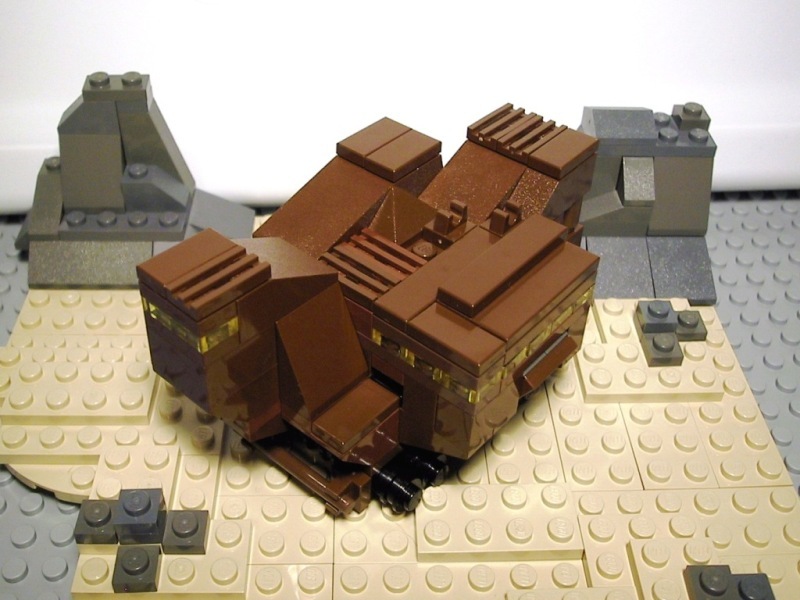 The Sandcrawler remains one of my favorite vehicles from the LEGO Star Wars line. And as of yet, LEGO has not released an official MINI version. 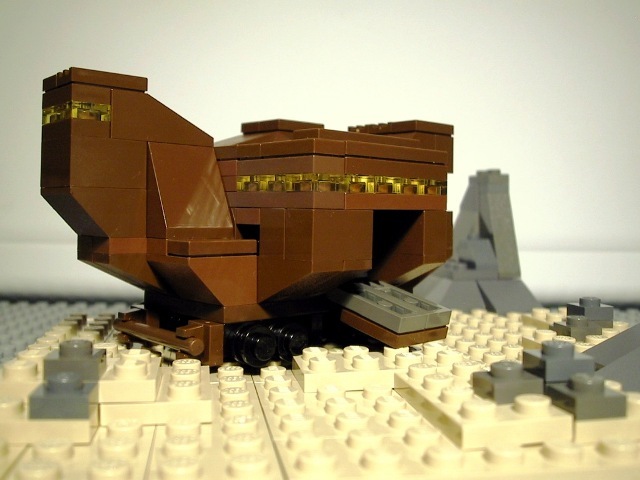 Your mission, should you choose to accept it, is to build a MINI Sandcrawler. Please read the following rules for this contest. Failure to follow the rules will result in your submission being disqualified. Disqualified submissions will have their post removed. 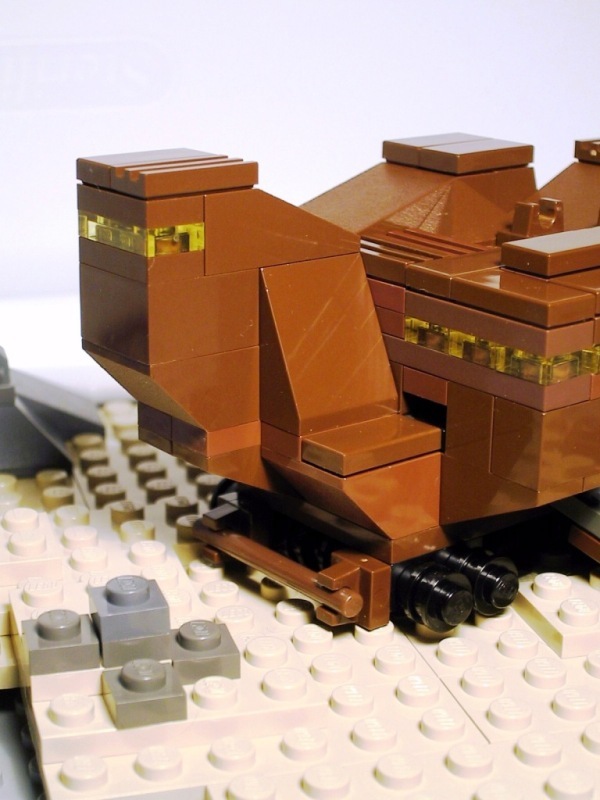 1) Your MOC must be made from real LEGO elements. No computer renderings will be accepted. 2) The scale must be "MINI" scale. 3) You may post one photo no larger than 640x480 in your entry. Then link to your images or gallery. Do not post more than one photo in your entry. 4) Contest is open to anyone in the world. 5) In case of a tie, my vote will be the tie breaker. 6) Contest opens tonight. Submissions will be accepted through September 30. Voting will take place between October 1 through October 7. 7) Winner will be determined by your peers through phpbb's built-in polling system. Does the choice of colours count? I don't have THAT big of range of brown elements, so is that going to effect the judging? What is considered mini-scale. The number of pieces? size ? Lego can't even keep the scale consistent with their mini-models. Well, think of it this way. No MINI-scale model has ever been more than $7. So I wouldnt make a model any bigger than could be sold for $7. Considering he'd like to see that chain link piece used, an appropriate size would probably be kind of like the MTT, but shorter and fatter. And the question about colors: of course it will affect voting. There is no voting panel here, your peers on the board will be judging the models, and anything will affect what they think. 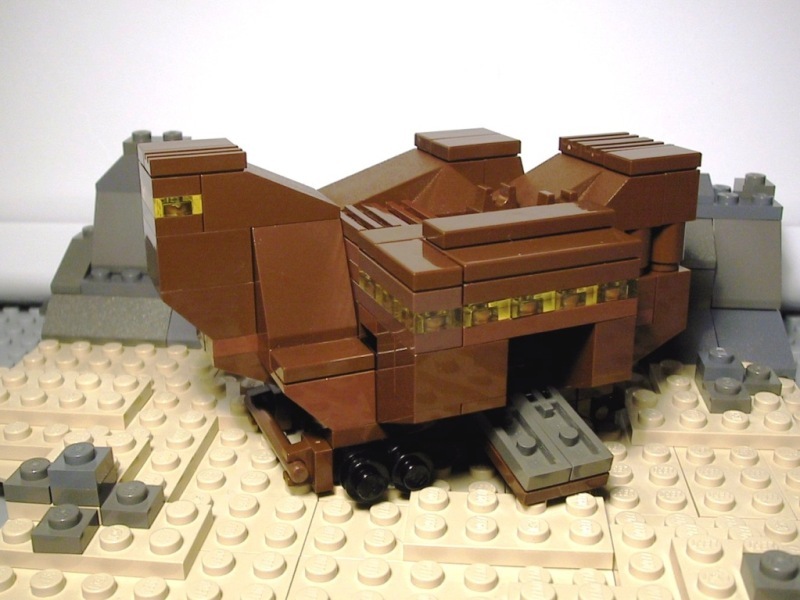 I've done some measurements, and if you were to build a minifig-scale sandcrawler, it'd be about 2 feet tall and 4 wide. So then... does this count as MINI? 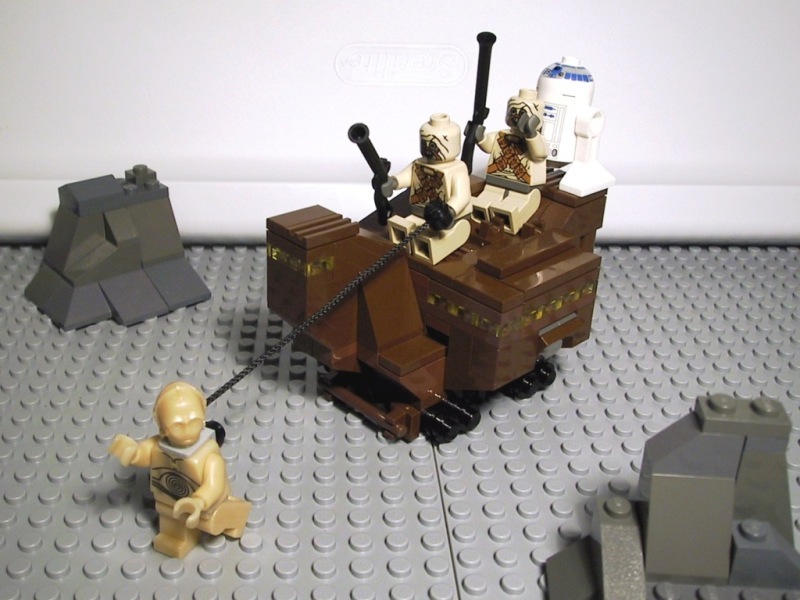 Okay, this is going to sound way stupid, but I have to ask before I tackle this project: When you say a MINI Sandcrawler, does that mean I can do an absolutely freakin original design, or are we going for an accurate custom of the infamous big brown rolling box ala Ed Southerland, Pepa Quin, and others? Just a minor confusion on my part. .. okay, I kid I kid. This contest is pretty clear-cut. I'll see what I can come up with, though I know I wont be using those treads. I'm geussing no one is gonna use those pieces... That said, count me in! Someone guided me to this contest, thus I will have a try, too. 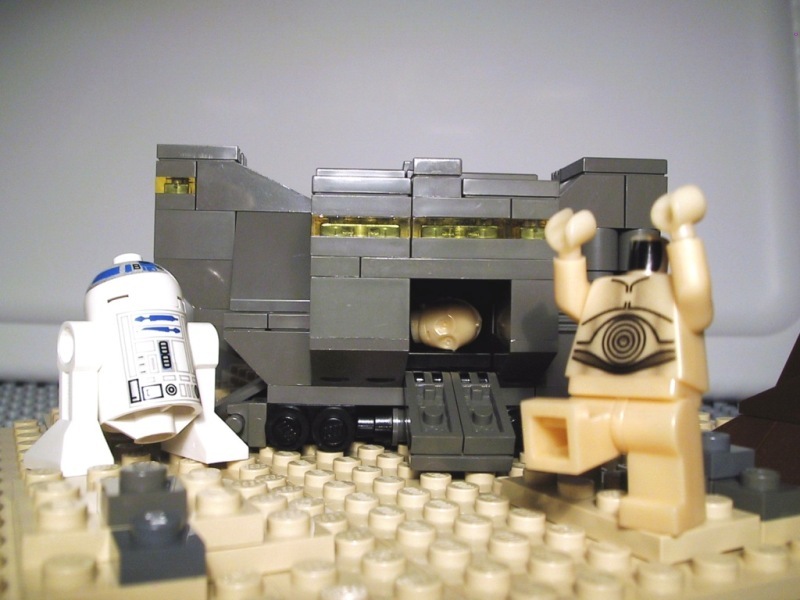 Here's my humble sandcrawler. 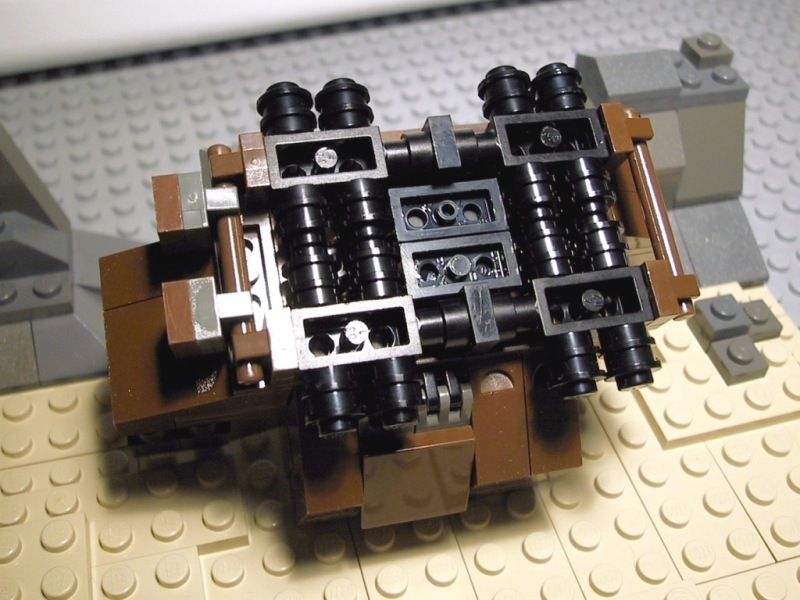 Although it has not the mentioned parts for the treads, these work instead. It is able to roll. Furthermore it is built completely studs down as the slopes 2x2x2 don't come inverted. EDIT: I have withdrawn my contest entry, as the model was very old and resembled my work 2 years ago, when it was designed. Good luck all! You better "Take care" no one steals your entry by just building from the instructions Nice crawler, I'm sooo gonna lose. the voters would have to decide. that is true. you can define mini however you wish. most of the minis look just about right when they're next to each other. 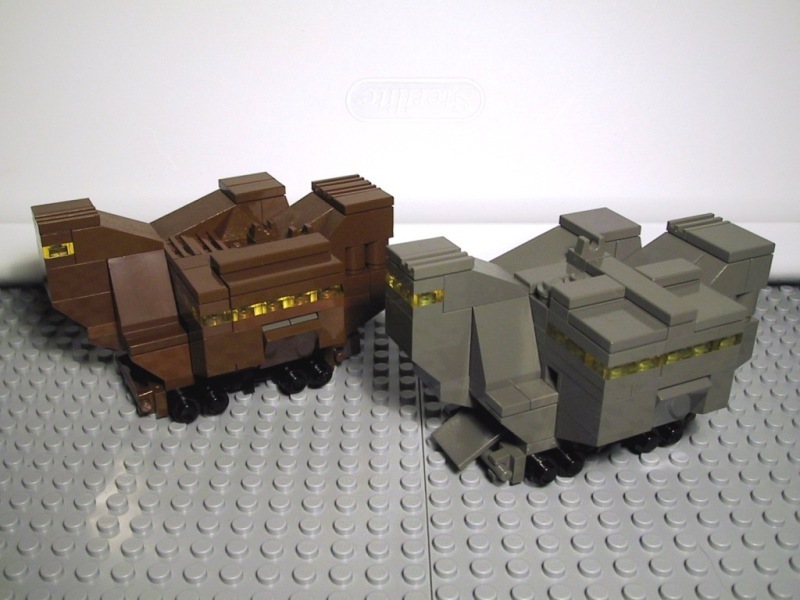 some of the larger vehicles, like the at-at, obviously don't look like they're in the same scale, but it's pretty close. Well dang. 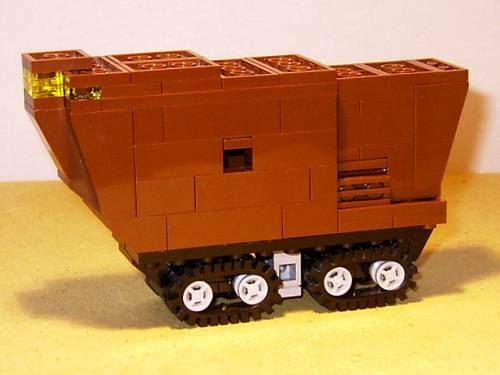 Legostein thought of the same tank tread idea I was going to use. It was about the only thing I had going for my entry. I'll probably still post it later tonight anyways. there are a ton of things you can do with this. even if you decide to make your scale a little larger, you can add a lot of detail. 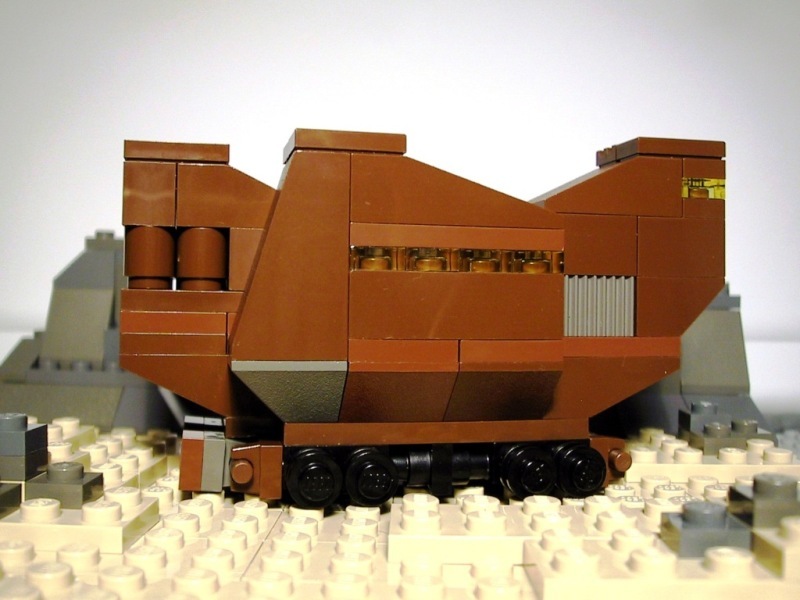 i'll admit i have a vision of what a mini sandcrawler would look like. 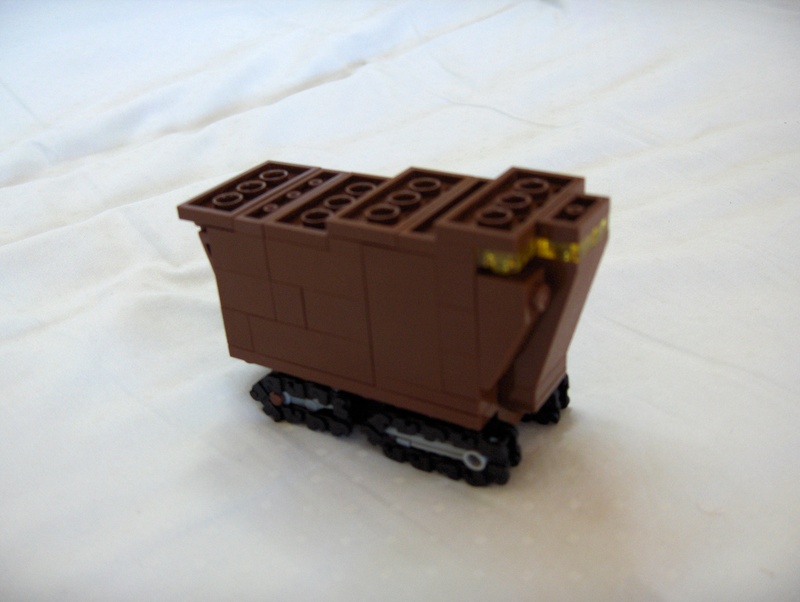 but to get it the way i envision it, it would be much larger than what LEGO has already established as "MINI"-scale. i'm wondering if any one of you out there can build what i'm thinking of. the scale i'm thinking of... the chain links i linked to should be a big clue. How many can we submit? I'm assuming one? What a piece of Junk! Well what do ya' think you'd get for a lousy 54 pieces! Mine is just over 50 pieces and it looks very good, but I cannot reveal it for a few days for lack of digital camera. I spent a good hour building this, and I must say I'm really happy with it, especially the treads. I successfully used the assigned treads, and in a fairly creative way, too. 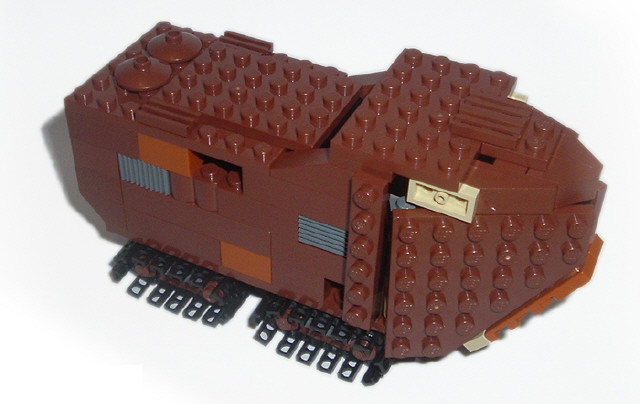 Coming in at exactly 100 pieces, I give you my MINI Sandcrawler! On an unrelated note, this is my first post. Whee. There is no spoon... there is only the forks. I know it's quite large for a MINI, but to get all the details into it that I wanted, a larger size was necessary. 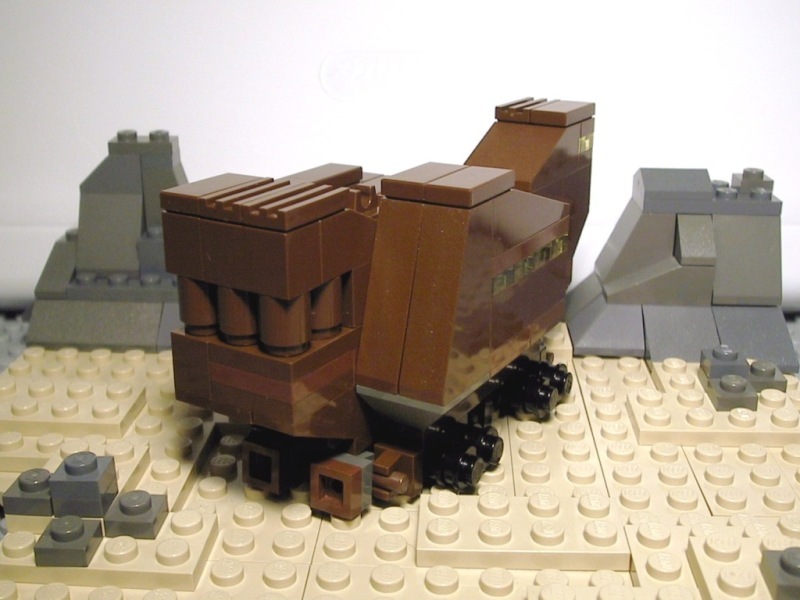 I took some cues from the 10144 Sandcrawler (which I think is a pretty crappy set, no matter how much Ace extolls its virtues. 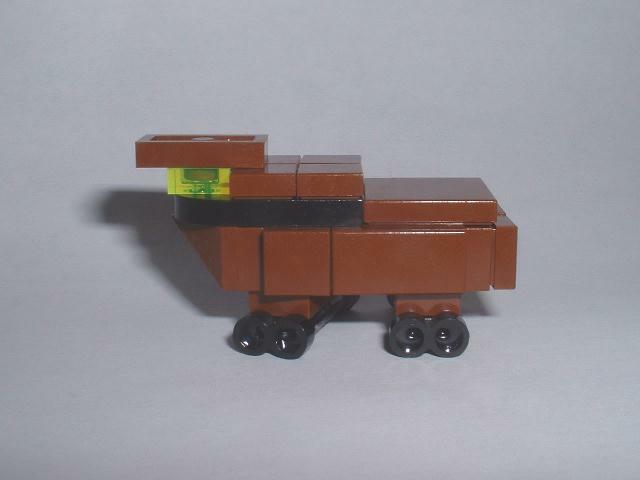 There's no getting around the fact that it's a big ugly rolling brown BOX): the front angles are achieved by inverse slopes and hinge bricks, mismatched brown pieces to achieve a "worn" look, and the top and rear feature minor greebling. The entire top part comes off pretty easily, but I'll spare you a photo since the interior is mostly hollow and there's nothing to see inside. The gallery will be moderated soon, but I'll be reuploading a cleaner batch of photos in the next day or so. Posted: Sat Sep 03, 2005 8:00 am Post subject: NICE! This is the first contest I try on-line. 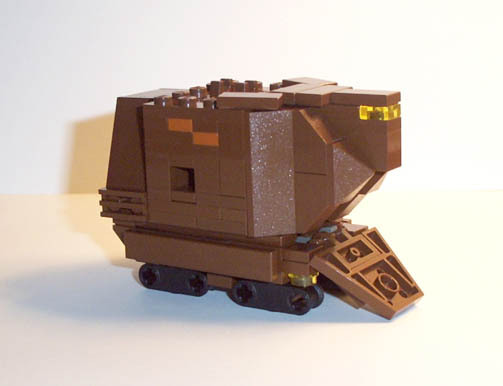 It look more micro but if you compare to mini star destroyer it's too big so I call it mini sandcrawler. It have 28 parts. I hope you like it, I didn't see anything about a piece limit so I didn't keep track and I think it must be worth less than $7. Thanks for looking. 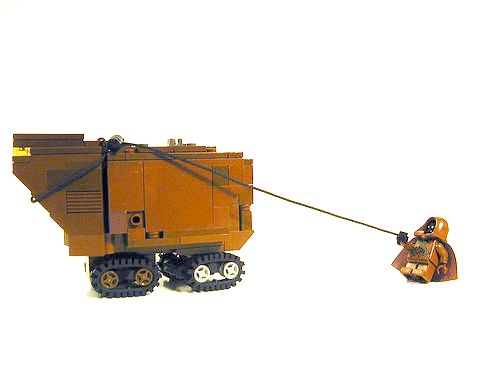 Here is mine, I don't have any chain link treads so I used the ones from the big sandcrawler but they could be easily substituted with the other chains. Location: In the basement waiting for you to go to bed so I can raid your refridgerator. Where do we send the pics? Do we just post em here . And red5, yeah, thats how these building contests work. You need to upload em to a site and post the pics here. [i]And red5, yeah, thats how these building contests work. You need to upload em to a site and post the pics here. Sept 15 update - now in Brown! 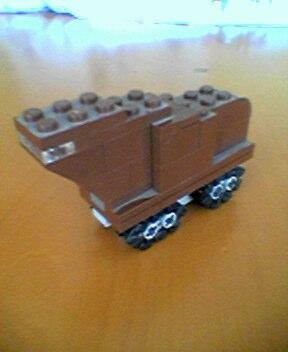 Thanks to a new HP set, I got the extra pieces needed to build my concept crawler in brown. This version is similar to the original gray version, with a few mods. Old and new brown was used to give that weathered and repaired look, the top was slightly lowered to give the crawler a lower profile, the top details were done differently, and the treads were made more substantial. I'm not sure if I like the brown better than the old gray. Let me know what you think. 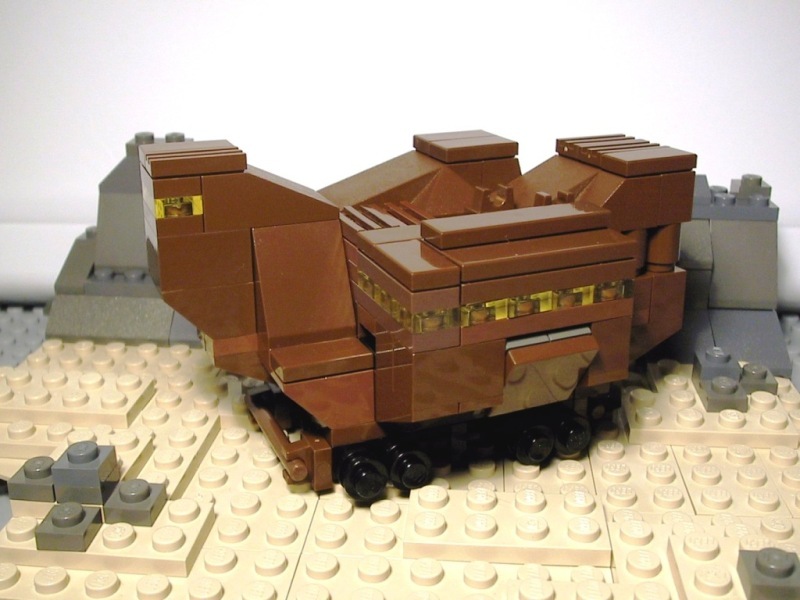 This crawler is a much larger successor to the original Sandcrawler, with the capacity to hold complete mining and mineral processing facilities and living quarters for an entire mining colony. The model itself features details like a huge loading ramp and an elevated deck and personnel entryway for docking access and open air observation. I scrapped my earlier silly sandcookie model for this more serious concept model.. hope people like it! I'm sorry, that pun was totally uncrawled for. Too bad I don't have any of those special treds, but it doesn't look like they would've fit anyway. Instead, this features independent steering and opening hatch.